Sigur Rós Announce New Album Entitled ‘Valtari’!!! The amazing Icelandic group Sigur Rós will release their new album titled ‘Valtari’ on May 28th. The album will have eight tracks and be “more electronic stuff than before, but don’t worry, we haven’t made a dance record.” bassist Georg Hólm told Q Magazine. 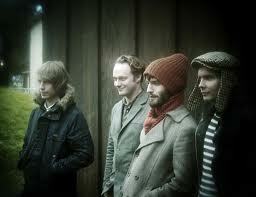 I’m a huge fan of Sigur Rós and I’ve been waiting for a while now for their new LP. I’m sure this new album will be majestic, cinematic, and beautiful. This entry was posted on Monday, March 26th, 2012 at 12:29 pm	and is filed under Music, News. You can follow any responses to this entry through the RSS 2.0 feed. You can skip to the end and leave a response. Pinging is currently not allowed. « Geek Deal of the Day!!! Disney Blu-Ray Box Sets for 50% Off!! !